There are some striking passages in the new “Cycling in the Netherlands” report (via David Hembrow). Wearing a bicycle helmet for daily trips is unusual in the Netherlands. Only competitive cyclists or mountain bikers tend to wear a helmet for their sport. Some parents give young children bicycle helmets. Usually the helmet is simply packed away for good before the offspring are 10 years old. There is certainly no support for mandatory helmeting. The fear exists that making it mandatory would cause a drop in bicycle use. Sound dangerous? No, the reverse. To talk about the relationship of bike helmets to safety is, it seems, to approach the situation in the wrong way. A useful analogy, I think, is to consider the presence or absence of certain species of birds in our environment. The near-disappearance of the peregrine falcon several decades ago was, it turned out, an indicator of the presence of toxic contaminants in our midst (it wasn’t just a bird problem, it was a human problem); we addressed the problem (somewhat), and the falcons returned. Conversely, the appearance of a flock of bike helmets could be read as a sign of safe and responsible individual behavior, or it could represent a species under attack in an unsustainable environment. To take another example, various species of woodpeckers have been on the decline, not just because of habitat loss, but because of the decline of natural processes, like fire, that give them the habitat they need. There too is a metaphor for cycling culture — without habitat, without the right habitat, a species won’t thrive. 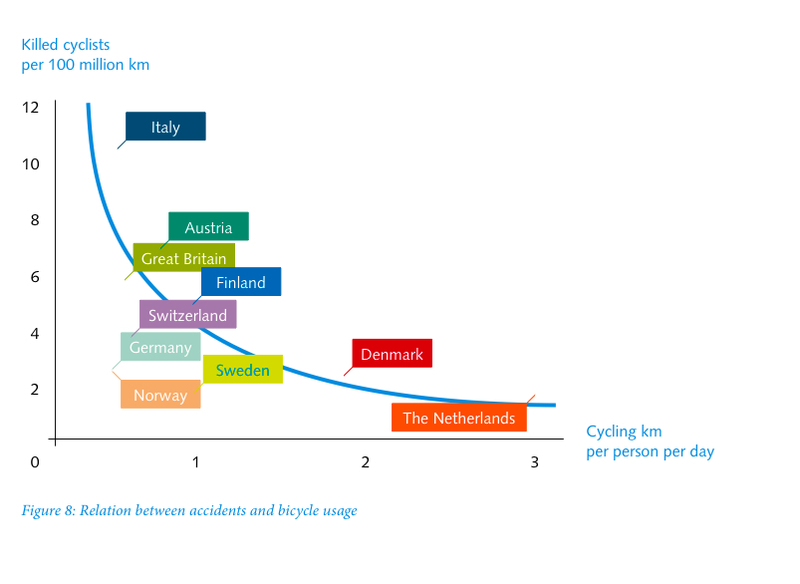 Given the Netherlands’ experience, helmets matter rather little — much more important are facilities, riders, enforcement, incentives, and the broader culture comprised of these things. Most children are taught to ride a bicycle by their parents or a brother or sister at a very early age. This is less apparent amongst the growing of migrant population. Traditionally the bicycle is not part of Turkish or Moroccan culture. Often the parents cannot ride a bicycle, so no suitable bicycles are available in the household. In large cities with many migrants, extra attention is thus devoted to cycling skills in primary school. To ensure that all children gain cycling experience, the Amsterdam municipality makes bicycles available to schools, for instance. In a number of cities cycling courses for migrant women are also held. They can then master cycling in a protected environment. Many participants enjoy this as an opportunity to develop more skills. The city giving bikes to schools — amazing! Here (in NYC) we read about community resistance to bike lanes so as not to interrupt the smooth vehicular conveyance of children to schools, typically in oversized vehicles that themselves are a threat to the urban environment. Comments Off on The Helmeted Cyclist as an “Indicator Species”. Click here to leave a comment. Negligent Design or Negligent Driving? Via the St. Petersburg Times comes an interesting discussion of highway design featuring an old bugaboo, exiting on the left. In Traffic I spoke with some people at the FHWA who mentioned, essentially, that contemporary highway design tries to avoid exiting on the left, for a variety of reasons, including driver expectancy. The piece brings up a number of issues. For one, it notes that three people have died on this section of highway, including one last week. No figures are given before that, though the facility opened in 1978. So whether this is an epidemic, or merely random, is hard to say; there may be a “regression to the mean” and we won’t see any further fatalities for the next ten years. Second, and always lurking, is the issue of “driver behavior.” The most recent fatality, the article notes, was traveling 93 MPH. Is there a social responsibility for protecting someone behaving that negligently? If he had died by striking another vehicle, we wouldn’t be talking about bad design. Further, can good design save everybody (and what would the cost be)? I’d say we should be more worried, socially, about the harm that person may cause to others (and keeping those people off the road). The German autobahn was and is considered a design marvel; its smooth tarmac has also been home to many spectacular deaths. Well, technically, people, there’s no such thing as a “fast lane.” There’s a passing lane. There’s also a speed limit. I also note a sign that clearly marks a reduction in speed on the ramp. And this isn’t really the sort of left-hand exit that people normally talk about giving drivers’ trouble — this is really the majority of the highway quite clearly swooping up and off to the left. That said, the state engineers may be a bit too blithe in dismissing the risk. As a casual observer, I can imagine any number of small tweaks that could be done here relatively cheaply (cheaper than raising the height of the concrete walls). Rumble strips, flashing lights on the signs, etc. But I wouldn’t say this warrants some expensive overhaul — where’s the money coming from, anyway? — due to the actions of some severely negligent drivers. Comments Off on Negligent Design or Negligent Driving?. Click here to leave a comment. A recent night featured the amazing pickpocket/thief/magician/security consultant Apollo Robbins — featured in the above video — and the equally impressive cognitive scientist Christof Koch. At one point, Koch was talking about the cognitive impairment of cell phones while doing something like driving. And then Robbins chimed in with another hazard I hadn’t previously considered. He noted — and this is a man who knows how to take things off of people — that a person walking along and talking on a cell phone is a red flag to a pickpocket. Why? Robbins’ work, while certainly involving some physical dexterity, is really about redirecting people’s attention. Not simply their eyes, but their entire focus of attention. A person talking on a cell phone has already allocated a good deal of attention to that conversation, is dedicating another good portion to walking down the street, and is thus less likely to notice someone like a pickpocket removing them of their valuables (everything but their cell phone, at least). Comments Off on A Cell Phone Risk You May Not Have Considered. Click here to leave a comment. A new and occasional series of traffic facts that were novel to me. I was in lovely Savannah, Georgia, yesterday at a AAA safety conference. I heard many interesting things (and managed to sneak out for some quick BBQ at Wall’s, a great place hidden in a house in an alley that I hadn’t been to in years and was worried may have closed in the intervening time). One random fact I heard that was new to me was that Massachusetts has the lowest seat-belt wearing rate in the country. Somehow I had imagined some Western state (or maybe Alaska) would take top crown, not a relatively wealthy state with a concentration of high-tech and academia. Of course, the irony here is that Massachusetts, per mile, has the lowest fatality rate in the country — a fact that surely has to do with density (not so many chances to get in trouble, and lots of nearby trauma centers).